Right now, in GN head quarter near Beijing, in the ware house, there is a set of oil drilling mud system ready for shipment. This is a drilling mud system for a ZJ50 land rig and it will be used for India Drilling. This is for a complete drilling mud system with all necessary separation phases, the 4 phase of clarification and 5 phases separation. shale shakers of 3 sets, they are connected directly to the mud distributors and worked at same time. They are located on shaker tank. Recommended GN shale shaker. vacuum degasser, it follows the shale shakers and will be used to separate out the air bubbles from the drilling mud, it also plays a role as a big mud agitator and it helps to protect the centrifugal pumps for feeding the desander and desilter and also enhances the working efficiency of the hydrocyclone feeding pumps. desander and desilter, respectively of 10 inch cyclones and 4 inch cyclones. Recommended GN desander and desilters. decanter centrifuges, they are used for recovering the barite and for extra fine particles separation. Besides mud solids control system for oil and gas drilling, mud plant, oil and gas waste management systems for drilling mud and drilling cuttings, GN products also covers the mud mixing systems for the HDD drilling, CBM drilling, TBM projects and water well drilling. 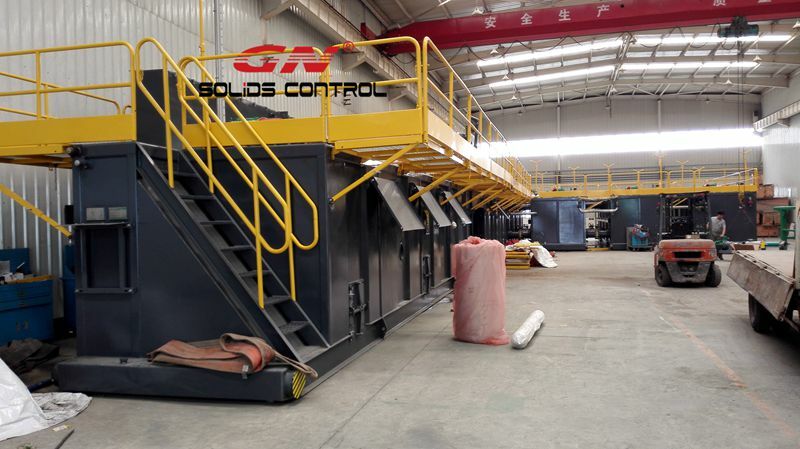 And some of GN clients are using GN Solids Control’s equipment in their industry sludge separation works. 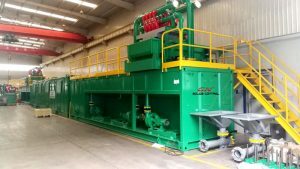 In each year, GN engineer team makes new improvements for the existing equipments and also design and put into reality the new equipments to feed the new standard for the environment protection or the requests from the clients and end users. 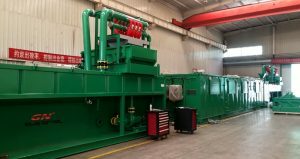 That’s why GN’s products such as shear pump, Mud Gas Separator , mud agitator , Vacuum Degasser ,etc. and fame are becoming better and better. 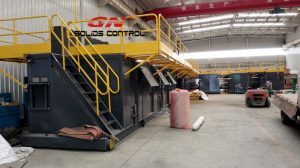 In the past year, GN has put into use the solidification unit for the oil based mud cuttings and end users from both domestic and abroad give good feedbacks.